v, 34 pages, illustrated, 8-1/4" x 11 5/8"
Written by an engineer who is interested in getting results, this booklet is loaded with valuable information. With a number of papers published in professional engineering journals, Cairns is no novice; he knows what he's talking about. Since this is a 36 page booklet each chapter is necessarily short. But what you do get is loaded with valuable information. Remember this is written by someone who is interested in getting results. The last nine pages are dedicated to the model with six pages of detailed, dimensioned drawings. Nikola Tesla is famous for the Tesla Coil, but another of his inventions is the subject of this book and had nothing to do with electricity, other than as a possible means of generating it. This was his Disc Turbine for which a British Patent, which also covered a compressor variant, was granted in 1910. 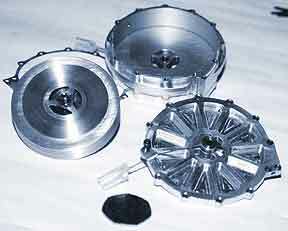 Unlike a conventional turbine, in which the rotor consists of bladed segments, in Tesla�s machine these were replaced by discs, working on the concept of flowing media being converted to rotary motion by friction working on the discs. Tesla claimed that a very small, but extremely powerful machine was possible using this principle - his aim was to produce a 25 hp machine that would fit inside a bowler hat. Here W. Cairns describes in detail the concept, and the history, of the original engines. He then proposes a number of uses for such turbines, including car and light aircraft use, all of which illustrate the extraordinary versatility of Tesla�s engine. Finally he provides the design and building instructions for a small Tesla turbine which any model engineer should be able to build. 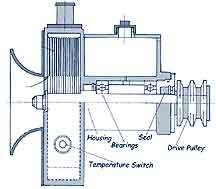 Not only does a Tesla Turbine provide a very high power to size ratio, it can be used as a compressor or pump. Tesla used steam on his test machines, and the model featured here would probably be run on compressed air, but the gas turbine principle can also be used; this really is a remarkably versatile machine. This versatility means that ninety four years after the original Patents were granted there are signs of re-awakened interest in Tesla�s machine, as many of the original problems can be overcome with modern materials. What is really exciting is that any revival can be boosted by individual experimenters- here is the place to start! High quality. A4 format pages. Numerous drawings and sketches, including 6 pages of drawings specifically for a small Tesla turbine you can build. 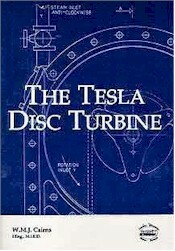 "This book describes the concept of the Disc Turbine as originally patented by Nicola Tesla, and provides concept designs for modern versions of the engine, incorporating the Disc Turbine as a power unit for applications in Automobiles and Light Aircraft, and also give descriptions of the original Turbines and the prototype machines. It also provides designs for other machines operating on the principle of a disc turbine: an Air Compressor, an Air Motor, and a Vacuum Exhauster. The facility of the principle to operate in either a clockwise or anti-clockwise direction of rotation, in a single machine, using only a two-way valve, is described, and applications where this feature can be applied to advantage are suggested. Data is given on the performances attained by the original engines, together with stress and performance information. Finally, we give a design for a modernised version of the original turbine, to one half scale, complete with working drawings and manufacturing instructions to enable the model or experimental engineer to construct a fully operational engine, using such tools and equipment as are usually available to model makers." From the testing section: "Run for no more than two minutes, stop, check the housing temperature. If cool to slightly warm, re-open the valve and continue running. At around 1.75 bar and 1.5 cfm, the turbine will attain a shaft speed of 20,000 R.P.M. At all times ensure a supply of oil to the bearings, and continually monitor the housing temperature. It should be noted that the prototype attained a speed of approximately 50,000 R.P.M. under no-load conditions; hence it is advised that a brake or dynometer be provided on the shaft."